Sometimes you have a property that is perfect in nearly every way – only it doesn’t have the windows facing the right way to give natural light where and when you need it. Or perhaps you have built an extension that changes the amount of natural light available to existing areas of the home. In either case, hardwood roof lanterns can be an elegant and sometimes dramatic solution. Roof lanterns are basically skylights, only bigger – windows in the roof or in some cases whole glass roofs complete with beams and girders. Hardwood roof lanterns can be designed either to maintain a rustic or rural look to a property – or to add a modern design element to more unusual places. And in all cases they can form something of a talking point as well as a sensible way of increasing the amount of natural illumination in the home. One of my favourite examples of the use of hardwood roof lanterns was in a kitchen extension I saw in North London. An old three storey townhouse had been converted from flats back into one home, and the ground floor was given over to a dining, living and kitchen area where the back part of the house was being stretched out to accommodate a bigger kitchen. This put the new end of the kitchen into a part of the garden where natural light fell only from the top – the sides being blocked by shrubs and bushes. So the builders incorporated a hardwood roof lantern into the design, making a glass roof for the extension supported by natural hardwood beams that not only formed a sturdy design but added a touch of drama to the finished room. Strung with low wattage white fairy lights, the beams themselves became a talking point when informal dinner parties were held in the eating area of the kitchen, with the night sky above and the gentle light from the fairy bulbs creating an intimate atmosphere for the diners. 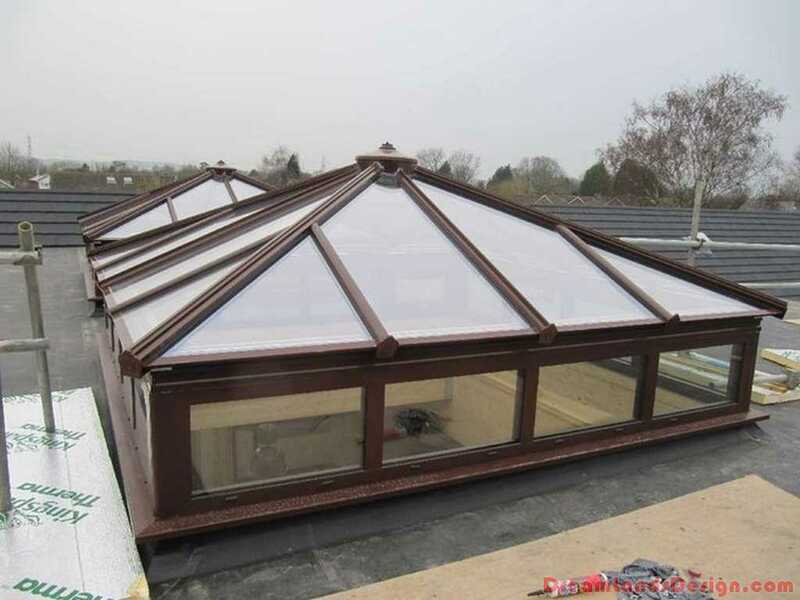 Hardwood roof lanterns can be installed with or without ventilation and may be built away from the home – that is they can be designed and put together by professional joiners in a workshop and transported to the site, or they can be dispatched with instructions for your contractors on how to put them together and install them. From making a dim staircase lighter, to creating a real talking point, roof lanterns are a unique solution to extension problems.